From all the rave reviews we’ve received this year, it seems like one of the highlights of Destin beach vacations is a cruise on the SunVenture. With its versatile open air arrangement, the SunVenture offers so many ways to have fun on the water. 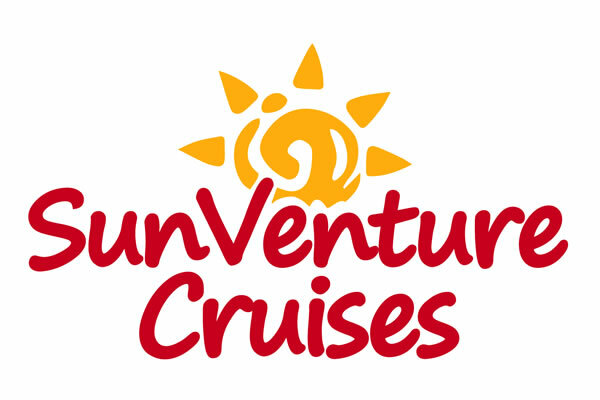 A great alternative to the larger Destin cruises, the SunVenture offers a more personal, relaxed setting for families and friends. 1. Crab Island – We are cruising twice daily to one of the most unique water experiences. Ranging in depths from 2 to 10 feet, the underwater sandbar known as Crab Island is the place where everyone anchors their boats and spends a day in the waist-deep emerald green waters. With picturesque views of the Destin bridge, Crab Island offers everything from live music and water slides to floating food vendors, paddle boarding and relaxing in the water. Pack a cooler and jump aboard as our Coast-Guard licensed captains take you for a narrated tour of the harbor and drop anchor at Crab Island. The boat stays with you the entire time, offers a restroom on-board and is much cheaper and convenient then renting your own boat. 2. Sunset Dolphin Cruises – It doesn’t get much better than cruising into the sunset as dolphins are frolicking from the emerald green waters of Destin Florida. We’re cruising every evening at 6:30 pm with our Captains Larry and Joe whose goal is to keep you laughing and entertained throughout the cruise. 3. Fireworks Adult Cruises – who says fireworks are just for holidays? In Destin, you can enjoy the Fireworks every Thursday night from the Destin Harbor. Life is all about family but if you’re looking for a break, then consider our adults only Fireworks Cruises. 4. Birthdays – Destin cruises are the ultimate way to celebrate any occasion – from birthdays to bachelor / bachelorette parties or family reunions. Our captains can take you to Crab Island, a sunset dolphin cruise or anything else you are interested in. We also have event planners and food catering options. 5. Private cruises– We can arrange for private cruises year-round, any day of the week, any time for any occasion. Boating is all about having fun in the sun and water. So why would you want to worry about fueling up the boat and driving while you watch your friends have fun? The SunVenture offers the best of both worlds…a private boat that our Coast Guard-licensed captains will drive so you can enjoy a worry-free day of fun in the sun. The SunVenture I is perfect for Destin private cruises and boat rentals for up to 49 guests. The 45-foot Catamaran features a state-of-the-art sound system and the open deck arrangement is great for relaxing in the sun or dancing under the stars. View our daily Destin cruises schedule for Crab Island, Destin Harbor Fireworks and Sunset Dolphin Cruise times. See ya on the water. There’s no other way to celebrate Memorial Day weekend in Destin Florida than on the water at the legendary Crab Island and on sunset dolphin cruises. The 45-foot SunVenture is cruising daily from the Destin Harbor for daily chartered cruises to Crab Island as well as sunset Dolphin Cruises. Bridge over the spring and summer, you’re sure to see a majestic view of boats anchored on the sandbar and people relaxing and playing in the waist-deep, emerald green waters. Crab Island was actually an island before the ocean currents washed part of it away. Now it’s a floating playground that has become a nationally-recognized destination attraction. 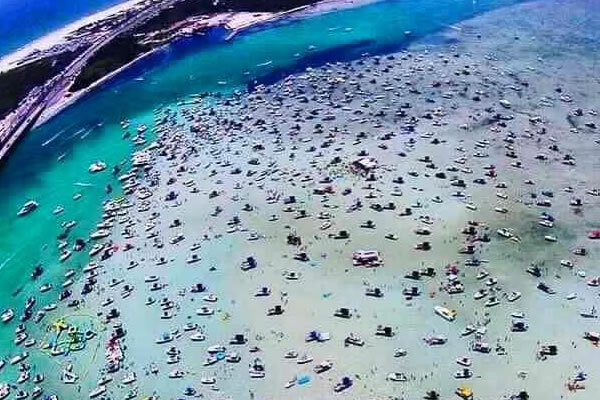 Crab Island is a summer tradition for locals and visitors alike as the ultimate way to celebrate fun in the sun and on the water but you can only get out there on a boat. 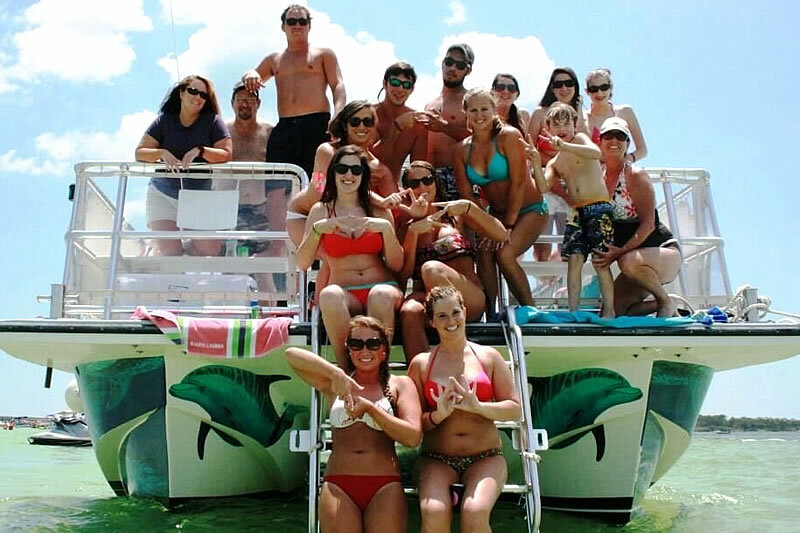 It’s easy to have too much fun in the sun which makes the SunVenture the best way to get out to Crab Island. Our Coast-guard licensed captains will take you out to Crab Island from our convenient new location at the Destin Harbor and drop anchor for 3 hours. We’ll drop the ladder and you can jump into the waist-deep waters. You’ll find a little bit of everything at Crab Island from floating bars and restaurants to people kayaking, snorkeling, paddle boarding or just relaxing on a float. If you’re trying to find things to do in Destin Florida beyond the beach, get ON the water and venture aboard the SunVenture I for a Destin dolphin cruise experience like no other. The Guy Harvey-inspired Catamaran keeps you within arms reach of the crystal clear waters and the closest seat in the house to see the dolphins up close while sailing into the picturesque sunset. The SunVenture’s 1.5- hour narrated sunset and dolphin cruise explores the beautiful Harbor and Gulf of Mexico as you revel in the Crown Jewel of Destin Florida. Destin dolphin cruises are narrated by our entertaining Coast-Guard licensed captain through the Destin Harbor as you cruise the emerald green waters to the Destin bridge and into the sunset. Kids can captain the boat and the open air catamaran offers the most up close and personal view of the water and dolphins. All seats offer the best views in this relaxing, personal setting. Check our daily Destin cruise schedule for Crab Island and sunset dolphin cruises and book online today. Crab Island cruise times vary from mid-morning to mid-day and sunset dolphin cruises are at 6:30 pm daily.